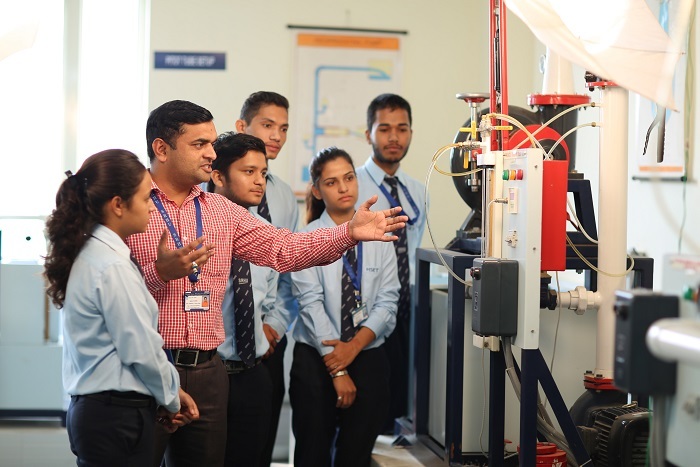 Himalayan School of Science & Technology (HSST) provides education in sync with the present Industrial needs through its various Programmes like B.Tech, BCA, MCA and Polytechnic Diploma. The programmes are coupled with academic flexibility, industry driven curriculum, and are taught using internationally recognised pedagogy. Student domain knowledge is enhanced through regular workshops, seminars, webinars and guest lectures by industry experts. More emphasis is given on practical learning, innovation and skill development to increase the employability of its students. The learning process takes place under the guidance of highly competent team of teachers. The faculty, having a blend of both industry and academia, provide hands-on learning and help students gain practical insights. Our well-equipped laboratories are designed with cutting edge technology to facilitate practical exposure, in tune with the need and aspirations of students, as well as, the demands of the Industry. Modern & Hi-Tech labs in various departments keep the students abreast with advanced learning methods and procedures. We also provide placement support to the students. Some of the recruiting companies are Capgemini, Deloitte, Wipro Technologies, Hitachi Systems, NIIT Ltd., Rubico IT, Rannlab Technologies, Lead Group, Apptunix, Maintec Technologies Pvt. Ltd, Info Seek Software Systems Pvt. Ltd., Spice Digital Ltd., Amazon Ltd., GBR Forgecast Auto- Parts, Bhilwara Info Technologies Ltd., Shaljon Technologies Pvt. Ltd., Aptara Corp, Marque Impex, Everest Industries, etc. I would like to take this opportunity to share our vision for the budding Engineers of our University. From the very beginning, our approach has been to groom and create Engineering professionals who are sensitive to the needs of the Society and can apply their technical knowledge to fill this gap in a sustainable, ethical and humane way. In the present scenario, the field of engineering education has become very dynamic and constantly needs to adapt itself to the changing technology. A wide range of Programs catering to diverse interests have therefore been designed for the students. The teaching learning environment at SRHU provides world class education, exposure to the latest technological advancements as well as hands–on experience through Training Programs, Workshops and other technical activities. Regular guest lectures by Industry experts, industry visits and interaction with eminent personalities of the various fields encourage students for innovation and research and prepares them to face challenges and opportunities that may arise in their professional careers.To add to this, the team of our outstanding Faculty and staff engaged in cutting edge research and knowledge brings fresh perspectives to the laboratory and classrooms. Housing the Medical, Paramedical, Nursing and Management Colleges under a common umbrella, SRHU provides a great platform for interdisciplinary research and innovation that can truly benefit the Society. In keeping with the mission of holistic growth of students in our University, students are also encouraged to participate actively in the yoga & meditation classes along with other cultural activities.The University makes a conscious effort to remain closely connected with the Industry and makes required revisions in its curriculum from time to time so as to ensure that its students do not graduate with knowledge of obsolete technology. To give our students an edge over the others, we have recently signed MOU with IBM (in the areas of Cyber security and Forensic, Cloud Computing and Data Analytics) and Uttarakhand Space Application Centre, a nodal center of ISRO.In a short span of four years, we have also been successful in winning the trust of reputed Companies like Capgemini, Deloitte, Hitachi Systems, Rubico IT etc. as our students are recruited by the Placement Drives. I would like to conclude by assuring all that we, at HSET make a commitment to prepare our students for lifelong learning and the ability to work in multidisciplinary settings. With my faculty, staff, students and alumni, I hope to build upon the existing Programs and develop new avenues in Engineering and higher education. I look forward to having you on board at HSET soon ! It is a full time Degree Course designed to cater to the dynamic and fast growing IT and Software industry. It aims at imparting comprehensive knowledge of Computer applications with equal emphasis on theory and practice. It focusses on training in the latest programming languages and tools to develop better and faster applications. This course is suitable for students who are interested in Computer Science and programming. It is a good alternative to the traditional Computer Science Engineering program as it is designed as per the Present Industry requirements. By the end of the third year, students gain an in-depth knowledge of the functioning of Computers. After acquiring the Degree, students shall be able to get entry level job in the field of Information Technology, Software Development, Web Application Development, or IT Enabled Services. There is further educational opportunity to go for Masters Program.